Don Imus has hired his very own Robin Quivers and her name is Karith Foster, left. Nothing wrong with that. Imitation is the purest form of flattery. And it is the right thing to do. Congrats Don, you're smarter than you look. And Karith aint bad to look at either. But then again you know how to pick the fine ones don't you? 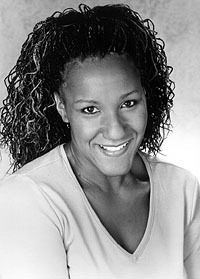 Karith Foster lives in Harlem and is from Dallas, Texas. Let's hope she has chemistry with Imus and fits in with his wild bunch. Robin Quivers gave Howard 'street cred' and allowed him to get away with probably waaaaaay too much. But Howard was accepted by Blacks because he talked to us instead of at us. I doubt Imus can get away with that because he is starting from a different place. But if he can get his Karith groove going, it might at least get him additional audience share. Good luck Karith. And don't forget to give a shout out to AAEA.